The fuel transfer pump articles provides guidance and review about different types, qualities, durabilities, and prices. This pump is used to transfer the different kinds of fuels such as petrol, diesel, gasoline, etc. Fuel transfer pumps are used to transfer of fuel to the engine and in the transfer of fuels to different places from the storage drum or tank. Fuel transfer to the engine requires a continuous supply of fuel in high-pressure. The fuel transfer pump ensures the continuous, smooth and efficient running of the engine without any interruption. The pump supplies the fuel at high pressure, so they possess good combustion and atomization capabilities. These pumps are used to various other applications to transfer fuel to different places. Power – the energy required for the pump to operate. We must choose a pump with suitable power that offers us seamless and smooth operation for the required application. And power is measured in terms of Horsepower (HP). Flow rate – the rate at which the fuel is being transferred. We must decide the flow rate depending on the amount of fuel to be transferred in certain time. The usage of these pumps in the fuel injection system requires precise fuel rate. The flow rate is expressed in terms of volume per unit time. It is measured in Gallons per minute (GPM). Mode of operation – We must decide whether the fuel transfer pump is fixed or mobile. Mobile fuel pumps are small in size and electric or DC powered. Mobile pumps are used to transfer fuels from storage tanks to different places. Power source – We must decide the power source of the pump such as the electrical, pneumatic, DC powered, etc. 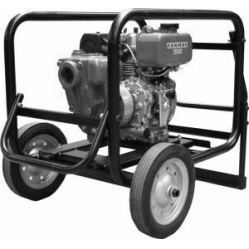 Mobile fuel transfer pumps are powered in the voltage range of 110V or 220V. DC powered pumps are provided in the voltage range of 12V, 24V or 48V. Pressure requirement – In automobile engines, the fuel pressure plays a vital role in engine operation. We must choose a correct pump to pressurize the fuel to the required level for the effective operation. External factors – we must consider the external factors such as the power chord length, supply lines, material, etc. In few applications, the storage tank is kept at a distance from the pump and fuel is pumped by a long hose pipeline. Environmental conditions – We must consider the environmental conditions such as temperature, location and operating conditions of the pump. The pump must be coated with a suitable medium if they are affected by the heat of the engine. In snow bikes, the fuel tank is kept at a distance from the engine. Easier engine operation due to the pressurized fuel input. Constant output across the different pressure ranges. A wide range of output flow rate possible from 0.25 GPM to several hundred GPM. Bit noisy and causes vibration. Priming problems. Tough to self-prime. May cause over-pressuring in the discharge end. A pressure regulator valve is required to control it. Fuel transfer pumps are used to pump fuels from the storage tank to the reservoir in fuel stations and in fuel injection systems in the vehicle engines. Few predominant companies that manufacture the fuel transfer pumps are Robert Bosch, DUAP, Gorman-Rupp pumps, Great Plain Industries and Castle Pumps. The prices of pumps used in fuel transfer from storage tanks cost in the range from 500$ to 2000$. Robert Bosch is one of the leading companies in the world and they manufacture pumps for the fuel injection systems. They do not sell these to customers but vehicle engine manufacturers and other companies who use them in their engines, etc. DUAP also manufacture the pumps used in the fuel injection system. Their pumps are manufactured with high precision and quality. Castle Pumps are distributors of pumps from various companies like Azcue Pumps, Grundfos Inc., CAT pumps, etc. They provide pumps mainly to the industrial and marine applications. They also provide specialized pumps depending upon the customer need and applications. Gorman-Rupp pumps manufacture the pumps used for the fleet applications. They provide pumps to transfer the fuel gas, oils, diesel, etc. Their pump sizes range from 1 1/4 “ to 8“ with a maximum flow capacity of 4800GPM.